Platanias and Agia Marina grew up at the same time, and both are practically identical: a long beach with a town behind it built for tourists only. Almost everyone here is on a package holiday; independent travellers do not come here often. 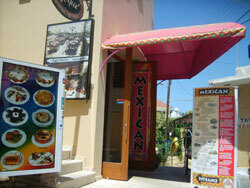 One thing Platanias does have that Agia Marina doesn’t is an old village. The village is signposted, and whilst it’s not all that interesting, it has some excellent views of Platanias and the beach. The second biggest city on Crete Chania is only a few kilometers away. 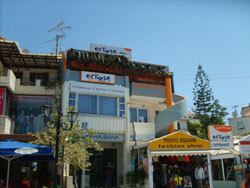 There are many things to do in Platanias: bars, mini golf, a go-kart track and so on. The tourists here are predominantly British and German. Prices here are high for Greece. There are some international restaurants here (e.g. Chinese, Mexican). Some hotels rent rooms at reception, whilst others only take package tourists. There are buses every twenty minutes to Agia Marina and Chania. There are also daily buses to Kissamos (about ten daily) and Kolymbari and Chania (at least one or two per hour) in the year 2019 (many more in summer than in winter). 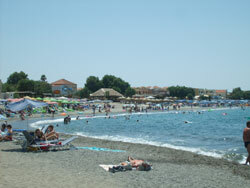 You can walk to the Resort Agia Marina or take a bus..